Hong Kong Art Week is back! Worldwide icon-chevron-right Asia icon-chevron-right Hong Kong icon-chevron-right Hong Kong Art Week is back! Organised by the Hong Kong Art Gallery Association, HK Art Week invites guests to engage with the city’s vibrant art scene and by enjoying more than 100 exhibitions around town. Take part in a wide variety of events including specialised art tours, a two-day art symposium at Asia Society (featuring guest speakers like Sir David Tang), a community-wide family art day, as well as a gallery tour that goes from Central to Sai Ying Pun (see below for details). The week-long event is also launching a special app for self-guided walks in three different art districts as part of the first-of-its-kind interactive art treasure hunt. A highlight on this year's Art Week programe is the Gallery Walk for Charity. Involving more than 50 of the finest galleries in Central and beyond, check out the best of the art world, with live music and performances, as well as a major public art installation, along the self-guided tour. 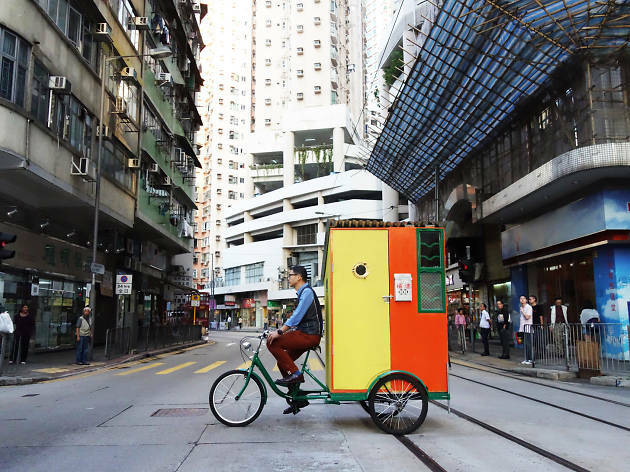 Hong Kong artist Frog King is also unveiling an art car made specially for Art Week. Decorared with the local artist's signature overlapping wheatpaste posters, the Le Mans Prototype racing car is on display in the PMQ Courtyard until 2 November. Whether you're a vetern art lover or dipping your toes into Hong Kong's buzzing art scene, there's something for everyone at Hong Kong Art Week. Don't miss it! For more information, go to www.hk-aga.org.